If you are an amateur, but avid, biblical scholar – you probably have wanted to understand the translation debates hinted at in your Bible’s notes. Could it make a difference in your study of the Bible? You know that the Old Testament was originally written in Hebrew. However, the Western school system does not commonly teach Biblical Hebrew. Online courses are a way for mature, enthusiastic students to gain access to this ancient language. Biblical Hebrew is an ancient form of Hebrew, the language of the Jewish people. Understanding Biblical Hebrew is necessary to critically analyze the Old Testament books of the Bible. The Old Testament was compiled from a variety of ancient Hebrew texts: the first five books of the Old Testament, which describe the origins of the Jewish people and their faith, are known as the Pentateuch; the remaining Old Testament works include historical narratives of political and religious leaders, wisdom writings, and accounts of the prophecies of prominent Hebrew prophets. Some of the wisdom and prophetic writings are poetry, while most of the others are prose. In addition to the Old Testament, there are the apocryphal books – that is, texts that are not accepted as part of the Old Testament but are still academically relevant religious Hebrew texts. Different sects of Christianity accept different books as legitimate parts of the Old Testament: Protestants accept the fewest books; Catholics accept ten additional others, and Greek and Slavonic Orthodox accept yet five more. Studying these apocryphal books enriches both one’s understanding of Jewish religious tradition and the process by which the Bible (as we know it today) was compiled. A smaller portion of Jewish Old Testament texts are written in another ancient language – Aramaic, which evolved from other Middle Eastern languages. Jews began speaking Aramaic when other Middle Eastern peoples invaded Israel and Judea. Therefore, once you have mastered Biblical Hebrew, Aramaic is a good next challenge. If you wish to delve into New Testament translations, Ancient Greek is the go-to language. Modern Hebrew is not likely to help you that much with biblical translation; however, it would allow you to communicate directly with current Israeli scholars in their native tongue, and it would make a trip to Israel easier for you and for native Israelis you interact with. The same can be said of Yiddish, a more recent Hebrew dialect that evolved as the Jewish people spread throughout Europe. To find comprehensive courses in all of the above languages – including Biblical Hebrew online courses – go to the Israel Institute of Biblical Studies. The Israel Institute collaborates with the Hebrew University of Jerusalem – an excellent university and one of the most prominent biblical research centers in the world. As a result, a course that you successfully complete through the Israel Institute of Biblical Studies gives you three-course credits from the Hebrew University, and such credits are usually transferable to other universities or colleges. The Institute also offers two certificate programs: Master of Hebraic Context of the Bible and Master of Linguistic Context of the Bible. Both programs are composed of five courses. The Israel Institute has two departments: the Department of Bible and Jewish Studies and the Department of Biblical Languages. The Biblical Languages department has courses in all Bible-related languages (Hebrew, Ancient Greek, and Aramaic), even including Modern Hebrew and Yiddish. In contrast, the Bible and Jewish Studies department is less language-focused and more concerned with the sacred locations and historical events in the Holy Land of Israel and the surrounding regions; courses from this department also address ancient Jewish customs, beliefs, and experiences. The Israel Institute’s website has six site languages (including English), and so it gives people almost anywhere in the world access to Bible and biblical language studies. The Institute and its instructors are located in Israel – the information is straight from the source, and the teachers genuinely know and care about the material. 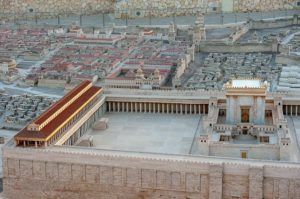 There is a connected blog site that contains articles about the Holy Land, biblical history, and biblical languages. Blog articles are available to anyone, so even if you are not an enrolled student, you can peruse this content to get a sense of what you would like to study. The Israel Institute’s courses take nine months to complete, with two to three hours of work per week. The individual lessons are to be watched live. However, while watching a class live is ideal, since you get to interact with the instructor and the small group of fellow students – the lessons are taped and you can watch them whenever you are able. There is an extra practice session each week that allows you to do homework with student or instructor assistance. Each student has a collection of materials in his/her Student Locker on the site: there are taped lessons, lexicons (dictionaries of vocabulary words), and course readings/ resources. If you want to communicate with fellow students more, there is a student forum – being a student of the Institute makes you part of a vibrant learning community. In general, obligatory assignments are kept to a minimum and, therefore, this learning system is great for self-motivated students. The Israel Institute offers a total of five Biblical Hebrew courses. Naturally, if you are a total beginner, you would start with the first one, Biblical Hebrew – Level A. This course essentially teaches you the basics of the Hebrew language. It starts with the Hebrew alphabet and relates its letters to the Latin alphabet. Then, it progresses to vowel sounds, phrases, and syntax (relationships between words). It ends with more advanced syntactical formulations and linguistic features – some of which are unique to Hebrew. Linguistic knowledge is applied to select Bible readings during the second half of the course. By the end, you will be capable of reading the Old Testament in its original form. The next course is Biblical Hebrew – Level B. This course imparts an even deeper understanding of Hebrew grammar and syntax. While it addresses the nature of the language itself in more detail, it is more like a literature course: you learn the nature of Hebrew poetry, as it applies to some of the texts of the Old Testament; you learn also the themes and ways of thinking that drove Hebrew writing. As you would in a literature course, different writings (from the Bible and other sources) are compared and contrasted in order to develop more nuanced interpretations. 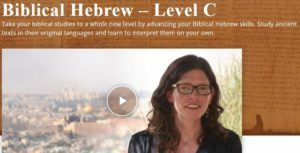 Next is the intermediate Biblical Hebrew – Level C. This course observes the connection between word choice and expressive meaning; also, you begin to identify different genres of Hebrew writing. Geographical and cultural contexts are further explored. The course features the story of King Saul and his struggles with King David; also used is the famous story of David and Goliath. Here, you will learn to put a character’s words and sentences in proper context and to appreciate clever wordplay in Hebrew. 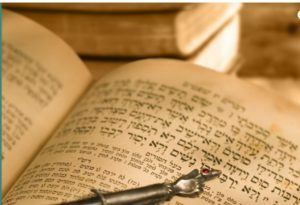 The second to last course in this entire program of Biblical Hebrew online courses is Biblical Hebrew – Level D. So much happens in this course: First, it delves into the interpretation of Hebrew poetry, using both biblical and non-biblical examples; it explores the syntax, words, and structures that are characteristic of different genres. The course continues to similarly analyze the vocabulary and syntax characteristic of law-related writings. Then, you learn how to use Hebrew grammar books to answer your own questions. Finally, the course describes the nature of prophetic writings and the characteristic linguistic traits of different types of prophecies. The last and most advanced course is Biblical Hebrew – Level E. This course involves a critical analysis of Hebrew’s changes from archaic Hebrew to the First and Second Temple Periods. During the Second Temple Period, Aramaic started to infiltrate the language of the Jewish people. There is a similar analysis of different dialects – you see clearly that Hebrew was not necessarily the same everywhere or in all contexts – even during the same time periods. You see for yourself how famous ancient texts, such as the Qumran texts and the Dead Sea Scrolls, are used to put biblical writings in context. Once you have completed all five of the above courses from the Israel Institute’s Department of Biblical Languages, you will be an expert in Biblical Hebrew. This will take you some time. It is quite a commitment; however, keep in mind that you could certainly take other academic courses during this time – with the Israel Institute, another online source, or a college/university. The Institute’s courses are designed for mature students – there is no time-wasting busywork, but you have to take the initiative to study and get help where you need it. This kind of course is especially helpful to adult students who are trying to pursue education while maintaining a career or raising children. Whether for self-enrichment, enhancement of Christian or Jewish faith, or a career in biblical research or education – mastery of Biblical Hebrew is a more-than-worthy challenge. No, they do not include such lessons, but forum discussions will be helpful in this respect. It is a very interesting idea to educate people about Biblical Hebrew. I think that persons need to be informed of the origins of biblical history because of the fact that there is more to the world than things that are man-made. What do you think of the Biblical Hebrew history? Thank you for sharing. Certainly, this history is full of symbols and meanings that still wait to be discovered. This is a really captivating topic, it is religiously expository from a Christian standpoint, and also very educating too. It’s amazing that there were so many translations and yet it was possible to arrive at the stage where some biblical scholars could actually find that connection that would transcend the modern day and age, thereby aiding the successful writing and presentation of the Bible as we know it today. I would like, if granted the opportunity, to learn ancient Hebrew and Aramaic. I have heard a lot prior to this time. Cheers. Indeed, the Bible encourages us to transcend reality, and its words build the ladder that leads to this transcendence. This page is very informative. I am actually interested in the Bible and am familiar with much of the background you provided. But for others that may not be educated in the Old Testament background, you have been very helpful. I played the video on the bottom about the Israel Institute of Biblical Studies. That was helpful also. This was a deep and very informative article, I never imagined there could be so much to learn, or better I should say I should have known but never thought about this subject before.I live in Spain, in a small village and sometimes the outside world seems so far away when the time in the village goes by so slowly. Nevertheless, as I was reading it reminded me that there is a world out there, so rich in culture, with so many things to learn. Thank you for reminding me of that. Hi Barbara. Indeed, culture and spirituality are our real treasure. Introducing an online course with subjects which are not available easily everywhere, will be helpful to many people. Getting a chance to study an ancient language through the online course like Biblical Hebrew is a golden chance. The course design has also separated in many particular different levels. I am going to share your article with my followers. Thanks for writing this helpful content.